The two subscriptions live in game offer different rewards. They are both priced separately. The Prime subscription costs $0.99 (or equivalent) per month and it lets you collect 5 UC daily and purchase items with BP. The Prime Plus subscription costs $9.99 a month (or equivalent based on region) and it has a first month discount at 50% off. 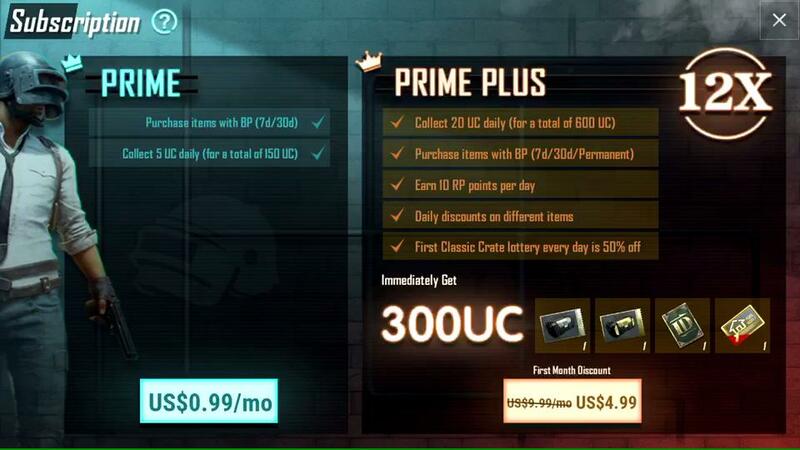 This subscription offers 20 UC daily for a total of 600 UC, the ability to purchase items with BP (including permanent), 10 RP points per day to be earned, daily discounts on different items, 50% discount on the first classic crate lottery daily, and immediate rewards including 300 UC and more. If you do play PUBG Mobile, we have a dedicated channel in our Discord for it. Make sure to join our Discord channel here to squad up. Now that Fortnite has controller support, have you been playing it more than PUBG Mobile?